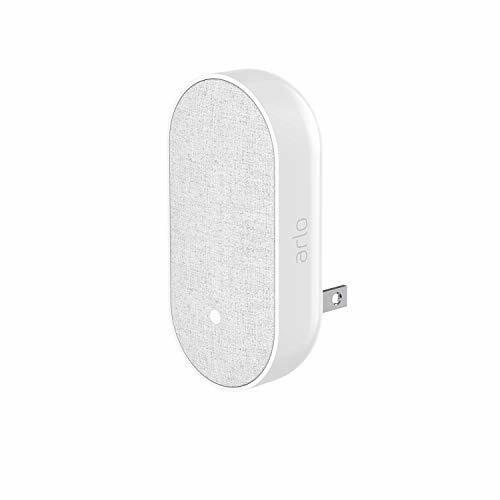 Requires existing Arlo Base Station to use an Arlo Audio Doorbell or Arlo Chime.Not compatible with Arlo Go, Arlo Q, or Arlo Baby cameras. Note : Refer to the PDF attached below in Technical Specification for User Manual and Troubleshooting starts on page 25. 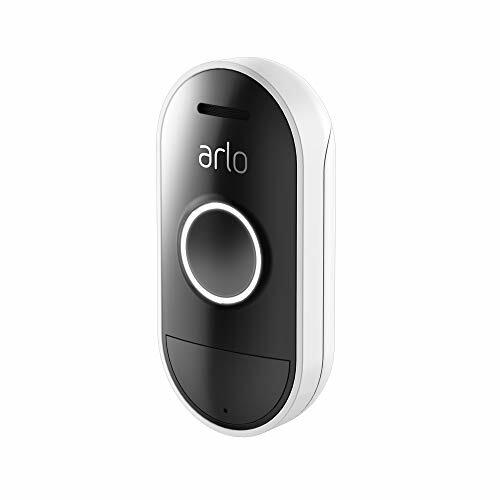 Brand: Arlo Technologies, Inc | Manufacturer: Arlo Technologies, Inc. FIT ANY DOOR: Replaces most standard U.S. door locks, both fit left & right handed doors. DIY INSTALL: No wiring and no drilling. The whole installation use only 2 screws. MINIMALISM: 1 touch and access with advanced fingerprint scanner, up to 100 users. CHARGEABLE: Use built in Li-ion battery. Charge 30 mins and work for 1 year. SAFE LOCKING: 3 seconds after being opened, it will automatically lock behind you. Brand: Ultraloq | Manufacturer: U-tec Group Inc. The most advanced keyless entry for homes and offices starts with the Lockly Secure Smart Lock Deadbolt Powered by PIN Genie. 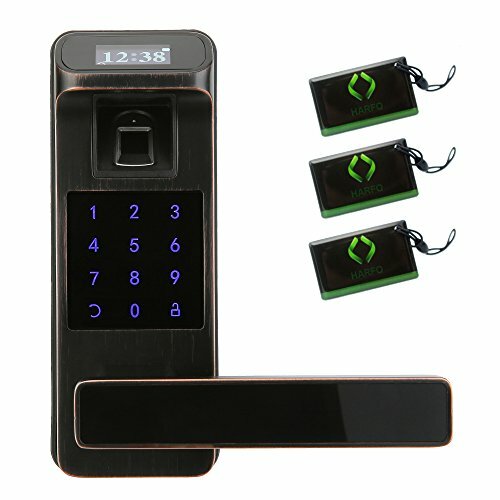 Lock and unlock your door with your phone, digital keypad, physical key, or even your fingerprint. Give keyless entry to family, friends, and other home service providers without stressing over lost keys. Easily add and revoke access with our mobile app and even store up to 99 fingerprints! The Lockly Secure Smart Lock installs into most doors up to 2" in thickness and works with left swing and right swing doors. Lockly Secure Smart Lock powered by PIN Genie Smart Lock has over 20 issued global patents in its proprietary patented keypad alone. The keypad randomly distributes numbers 0-9 into four buttons and all numbers reshuffle after each time of use, which makes it impossible for others to know and use your codes unwillingly. Designed and assembled with heavy duty zinc alloy, stainless steel and high-impact plastic with special scratch resistant coating for enhanced security, connectivity, ergonomics, and aesthetics. UNIVERSAL FIT The Secure Deadbolt Edition will fit any standard door from 1 3 8" to 2" Thick for left and right swing doors. It's important to follow installation set up instructions to program the lock to work for left or right swing doors. 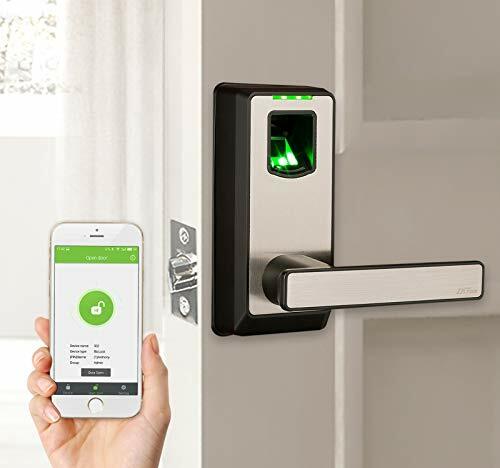 Everything you need is included to install your new Smart Lock. All you need is a screwdriver and drill (if needed for new doors) to finish your installation. 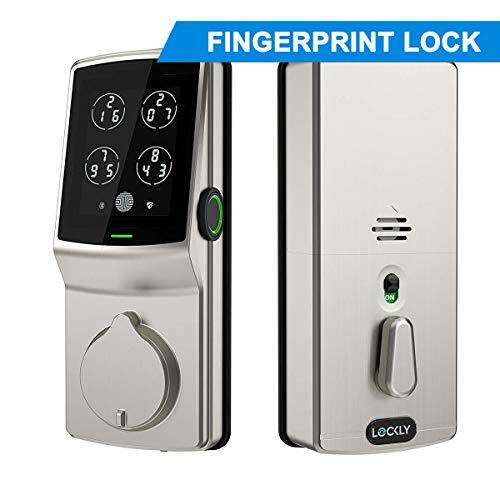 The Lockly Secure Dead Bolt comes with the new smart lock, screws, strike plate, assembly, and even a new bolt assembly. KEYLESS ENTRY AND CONVIENCE: Lock and unlock your door with one finger tap on your smartphones via Bluetooth or by entering a 6-8 digit access code on the touchscreen keypad. This door lock also comes with 2 backup physical keys in case you ever need. Secured keyless access convenience for your offices, home or rental properties. HIGHLY-SECURE SMART LOCK: The world's first Patented peek-proof smart door lock. The unique algorithm reshuffles numbers after each use and prevents others from copying your smart code, keeping your home safe. Touchscreen keypad will be disabled after 3 wrong attempts and can only be activated by entering the right code twice. Auto-lock, one-touch locking and Audible Alarm System provide enhanced security when you are at home or out. 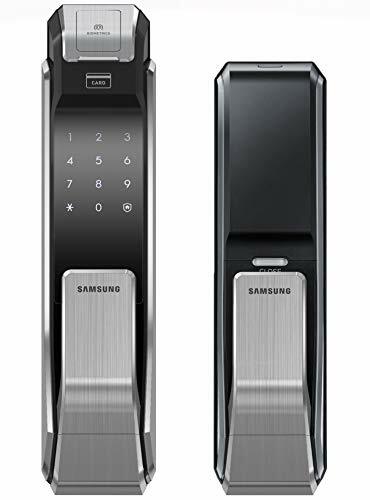 ADVANCED 3D FINGERPRINT SENSOR SECURITY: Feel extra safe knowing that this smart door lock features an advanced capacitive fingerprint reader. Whereas other locks use optical readers our 3D fingerprint sensor uses capacitors and electrical current to form an image of the fingerprint. This means only physical fingers will be accepted, preventing the use of lifted prints. This also results in speed and accuracy, granting access to up to 99 fingerprints in a split second. CONTROL ACCESS AND MONITORING: Works on both iOS and Android devices. This security lock will track unlock history by each user 24/7 and stores in the app for your review. Push notifications will be sent to you once your friends/guests check-in. Now, you'll know exactly who and when people are entering your business or properties. While using the virtual keys, there is no need for you to asking back the physical keys from guests or renters. EMERGENCY POWER SUPPLY AND DIY INSTALLATION: You can open your front door with a 9V battery on the instant battery charging terminal if you forget to replace the dead batteries. Note: The latch has adjustable backset 2 3 8 or 2 3 4 to fit most standard doors. (Please check your door measurements prior to purchase this smart deadbolt). You can find the installation manual, user manual and specification sheet under Technical Specification section for additional information. Innovation, quality, and trust have made Kensington the standard in device security for more than 25 years. 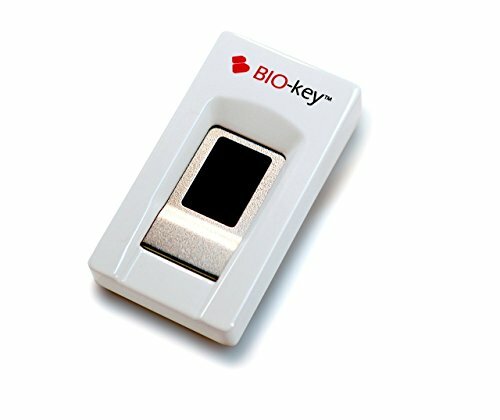 Kensington is expanding that expertise to data security by introducing the world's first fingerprint security key to support Windows Hello and Fast Identity Online (FIDO) universal 2nd-factor authentication (U2F) the Mark Fingerprint Key. 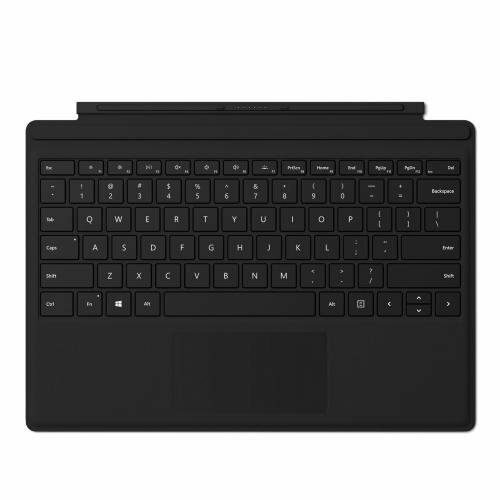 Engineered to provide simple, fast, and secure Windows logon and a seamless two factor authentication experience, the Mark Fingerprint Key protects against unauthorized access on compromised devices, while also offering unprecedented cybersecurity for today's cloud-based world. DIY INSTALL: No wiring and no drilling. The whole installation takes only 2 screws. SIMPLE USE: 1 touch and access with advanced fingerprint scanner, 100 users max. HARFO HL91 lock is equipped with OLED display, it makes visual menu based operation become true. Audit Trail feature allow you to track entry record. Double verification feature increase lock security level significantly. Enjoy adopted the latest semiconductor biometric fingerprint technologies that bring you a convenient and secure lock system. OLED DISPLAY + VOICE GUIDE will walk you through the whole process. You can simply use the touchscreen to add or delete user on the device. ALL-IN-1 FLEXIBILITY, fingerprint +access card(3 include) + code(4~12 digit) + backup key + double verification to unlock. Up to 300 users max and allow owner to track entry record. SEMICONDUCTOR SENSOR bring you a effective and secure fingerprint recognition system. It works well for kids and the elder. DEADBOLT BUTTON allow only admin users can access. When you enable this mode, increase your privacy level significantly. 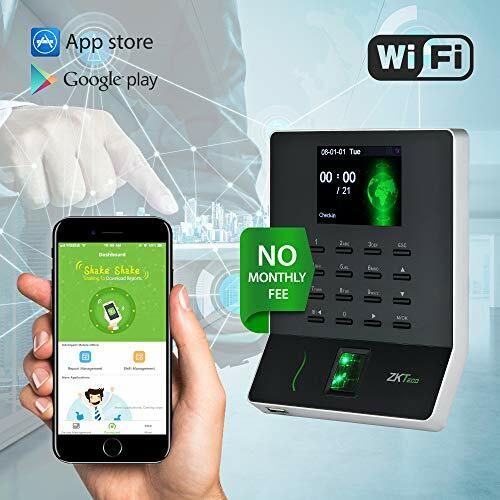 WL20 is Fingerprint Time & Attendance Terminal with Wi-Fi module. With Wi-Fi function, User needn't wire Ethernet cable, it supports hotspot mode and allow mobile APPs connection and check in/out and download record directly. It's associated with ZK new fingerprint reader, the operation remains stable under strong light source and high preciseness of verification of wet and rough fingers. It also has elegant design, it will start new stage of time attendance. 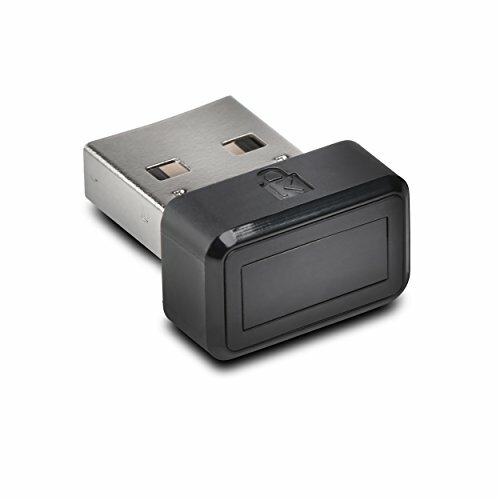 USB client & host Communication Method :This ultra-thin design attendance machine supports to download the report by inserting USB-Disks and finish the downloading in less than 8 seconds. Mobile phone APP Management The time clock is compatible with TA Assistant App which supports to download the report by shaking your smart phone.First set up your phone and device in the same WIFI,then connect these two.So easy. Stable operation of the fingerprint sensor Bio ID fingerprint Sensor ensures stable operation under strong light source and infrared auto-turning on function. Build-in SSR Excel software : No other complicated software needed and extra long-term license fee.It has built-in software which enables you to set shift /upload users' information/download report via USB flash drive in excel format. Important Notes :With simple and customizable features, you can easily set up the Time Clock to meet your business needs.Please be informed that it can't support overnight shift or two breaks in a working day,any problems please feel free to contact us customer service. 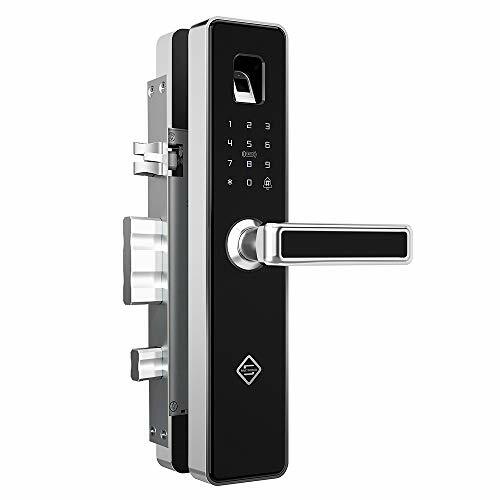 It's not just a simple door lock but with more additional intelligent functions - PINEWORLD Q303 Smart Lock. Doorbell function,Burglar alarm,Anti peeping password,Low battery reminder. Micro-USB emergency charging port,you can use the power bank to open the door when the battery is power off. Professional Interchangeable two-direction lock tongue, it can effectively prevent professional card unlock. Automatically locked when close the door, the door will be back locked when pull up of door handle. 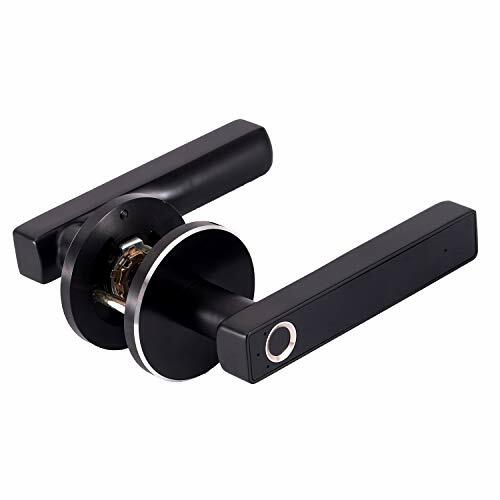 C-class stainless steel lock body is more effectively to prevent violent unlock, the anti-unlock time can be up to 270 minutes, common A-class and B-class lock body's unlock time is less than 5 minutes! Color: Black front with Red Copper side. Connection : Wireless Fingerprint Smart Lock. Battery Type: R6 AAA Size Battery ( not included). 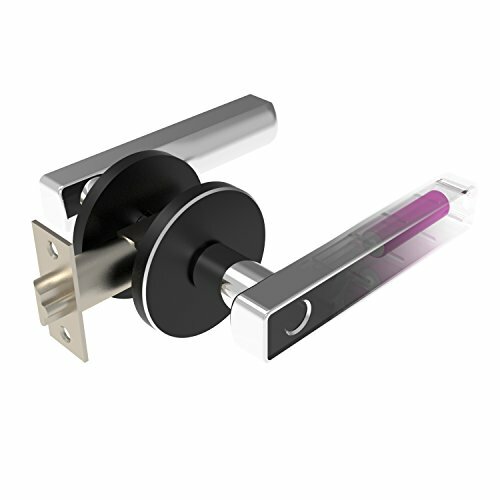 The lock body is made of 304 Stainless Steel with good impact strength and hardness,also excellent corrosion resistance and heat resistance, low temperature adaptability and oxidation resistance. The black surface of the panel is durable Anti-collision acrylic panel,it's still 304 Stainless Steel material under the black panel. Applicable Door Type: Composite Door, Wooden Door, Copper Door, Security Door, Stainless Steel Door and so on. Apply to: Household, Home/Office, Factory, Villa, Office, Hotel, Apartment and so on. If any questions about the product please feel free to contact us via Amazon Message and we will help within 24 hours ASAP. 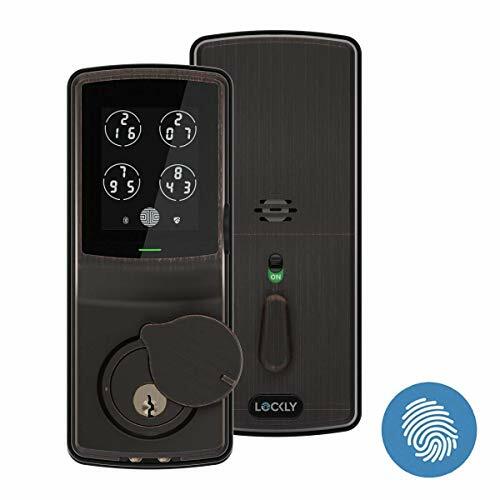 Four ways to unlock: fingerprint, user password, RFID card and mechanical key; Support up to 100 fingerprints and 100 ID cards (Recommended Operating Temperature: >= -13 ). Installation Video: https://youtu.be/oEx_Oa3sTAY OR Search PINEWORLD Q303 on YouTube. Applicable Doors: Door thickness between 40mm and 120mm, if any installation questions please message us. With Doorbell Function; Reversible Handle supports Right & Left handle; Idle handle design to prevent from forcible entry; Turn handle upward to lock deadbolt; Smart alarm for low battery; Voice guide for easier and more convenient use. Privacy protection & Anti-peeping: Add the random numbers before and after the correct password, as long as the password contains continuous correct password, the door will be unlock. It supports 6 to 12 correct password numbers and 24 random numbers. You can freely and easily enter the password to open the door even if there are strangers beside you. Bio-Electrostatic Fingerprint Identification Technology, identify speed <0.4s,effectively identify the elderly and children's fingerprints,refused to identify duplicate fingerprints; Smooth operation under dry/humid; administrator's multilevel-permissions applies to both working and home-caring. Package Included: Front and Back Smart Lock Panel, 1x Lock body, 1 Pack Mounting Screws, Product Manual, 3x RFID Card, 2x Mechanical Key. Any more questions about the product please feel free to message us or release your questions,we will help you ASAP. 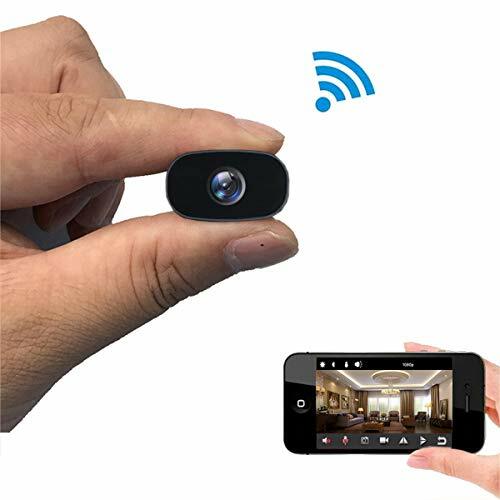 SUPER MINI & PORTABLE HIDDEN CAMERA: This mini camera is one of the world's smallest camera , which makes it perfect to keep an eye on your love or care. You can put this spy camera in the corner of home, office, store, car, even in your pocket or you can hold it in your hand. Easy-to-use mobile APP(both IOS and Android available) + PC multi-end operation, just download the application on the phone / tablet, can Point to Point of real-time monitoring;the camera connected to the home wireless network Only support 2.4Ghz frequency WiFi , you can remotely watch live video / receive motion detection alarm Tips and Pictures / Playback Memory Card Video files. This camera could support monitoring with 1080P HD resolution and can record video. It could support 128G micro sd memory card,can store up to 4 months of video files,All recorded video files could be remote downloaded, played or deleted by mobile phone APP which. Smart motion detection with immediate alert:When the camera detects a moving object, an alarm notification will be sent to the mobile phone immediately. 3 photos will be captured and transferred back to the APP while the recorded video will be stored in the memory card simultaneously(Note: needs to be setup in the app). Brand: PNZEO | Manufacturer: Shenzhen Clouds flying technology co., LTD. SECURE SMART LOCK DEADBOLT: The world's first Patented peek-proof smart door lock. The unique algorithm reshuffles numbers after each use and prevents others from copying your smart code, keeping your home safe. Touchscreen keypad will be disabled after 3 wrong attempts and can only be activated by entering the right code twice. Auto-lock, one-touch locking and Audible Alarm System provide enhanced security when you are at home or out. CONTROL ACCESS AND MONITORING: Works with both iOS and Android devices. Issue digital eKey to guests anytime for them to access the door and set them to expire when you want it. The Lockly smart lock stores all access history and syncs with your app via Bluetooth so you can review it anytime. Keyless Door Locks with Bluetooth/Biometric Fingerprint Door Lock Electronic Keypad Digital Smart Locks for Home AL20B with ZK Smart Key app. AL20B app smart biometric lock is designed to be "Real Keyless" for maximum convenience and flexibility,You are free to use fingerprint, code, key or smartphone to unlock. You will be never be locked out forever!Some notes for you before you buy,this lock requires the door to be drilled. 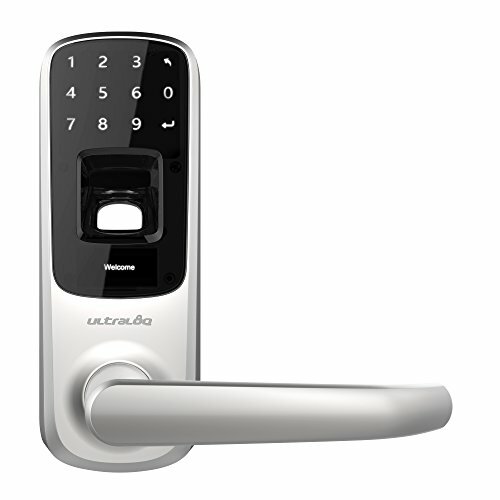 With One Touch Open enabled, the lock automatically connects and unlocks when a user presses the lock icon. One Touch Open combines the steps of connecting the lock from the Available Locks list and pressing the Open Door lock icon into one. Edit User ;change ID, name, priority, time zone. Opening Record Query: A 24/7 activity log tracks who enters and exits your home. And with unique keys for each user, you'll always know who opens your door and when. Convenient&Userfriendly: Share codes anytime anywhere, voice guide with adjustable volume, back up key for emergency,bluetooth 4.0 provide less consumption. 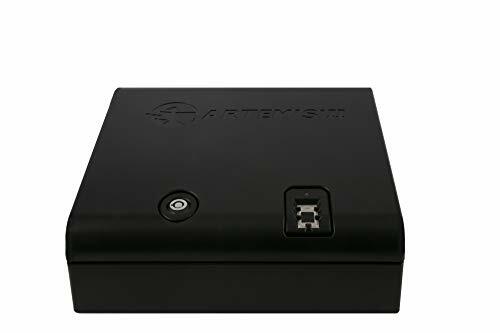 Discreet and child resistant, the Patent Pending Artemis 2 Gun safe was designed to reduce accidental firearm handling and accidents. However, it also works perfectly for those looking for a secure place for their firearm. Artemis 2 features a one-touch biometric fingerprint scanner, called "Second Touch". The high quality scanner is similar to fingerprint scanners on smartphones; easy to program, use, and can accept up to 200 unique fingerprints. It's small and discreet enough to fit under a bed yet large enough to easily accept 1911 model handguns and ammo. Artemis 2 is constructed from a weapons-grade plastic Polycarbonate polymer, the same polymer used in bulletproof glass and body armor! A loud tamper alarm will sound after 5 unauthorized attempts, and will cease with an authorized fingerprint scan. Additionally, the case has four mounting holes an anchoring cable, and a high security 2 latch system. The included 4 AA batteries provide up to 4,000 scanner operations, or ~ 1 year of use, at the end of which a low battery alarm will sound. A high security tubular-style key is also included. Interior Measures : 10 5/16" x 6 7/8'' x 2 3/4" Exterior Measures 11 1/2'' x 11 1/2'' x 3 3/16,'' "Artemis" is a Registered Trademark. UPGRADED with dual latching technology for heightened security. Constructed of a polycarbonate plastic polymer (an extremely durable weapons grade plastic polymer that WITHSTANDS THE WEIGHT OF A FULL SIZE TRUCK) making Artemis CHILD RESISTANT, virtually indestructible, and torture tested to ensure quality and customer satisfaction. Artemis is a registered trademark. ONE STEP TO OPEN - SIMPLY PRESS (pre-programmed) FINGER on 360 degree omni-directional print scanner - reads prints from any direction. Authorized (programmed) fingerprint scans activate a green light & open the case Unauthorized prints will activate red light, and case will remain closed. A loud tamper alarm, sounds after 5 unauthorized attempts, to protect against accidental handgun access. Alarm is easily turned off by an authorized fingerprint scan. Please note, SWIPING WILL NOT OPEN CASE. Do not turn, but Push! The Push Pull Innovation. Push from outside! Pull from inside! With the Push Pull's design advancement, provides more convenience in everyday door operations. Just like operating car doors, ONE Step Push and Pull(one step to open and close) innovation opens a new way to operate residential doors ever more comfortable and convenient. Perfect security using the state-of-the-art personal fingerprint scanning method Convenient authentication methods aimed to reduce worry over key loss or password hacking, this state-of-the-art fingerprint recognition system increases safety and security. 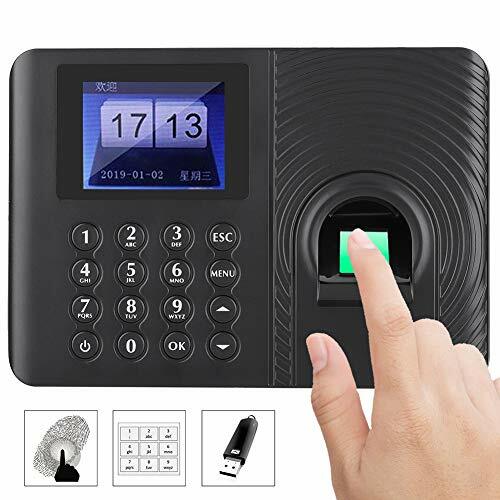 Enhancing user convenience with easy door opening and closing access feature, the key pad panel is covered automatically after pressing the door's center open lock button thereby enhancing the security of the fingerprint identification panel. 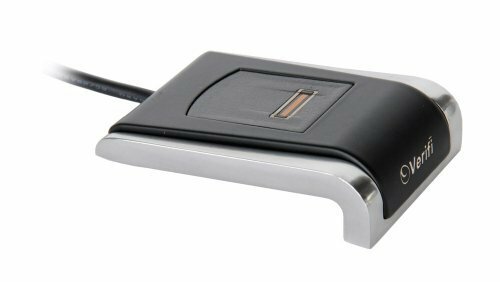 Able to register and recognize 100 fingerprints,this secure smart door lock system can as well be utilized for small and medium companies. Dual password and fingerprint scanning input : Double Authentication Mode With the Double Authentication Mode setting, home security is strengthened and allows for greater security access. Door opening access requires two authentication verifications; both password and fingerprint system input therefore it is safer and more secure. It is imperative that while the Double Authentication Mode is on, you do not forget the password. Welcome feature for Users The equipped IR sensor automatically activates the Welcome Feature, once the sensor detects any motions within the range of 70cm. Locking Notification Feature The door dock automatically notifies their status on the touch panel, displaying messages like 'Locked' and 'Unlocked', which adds value to the daily usage experiences. Securing door management with robust dual structure. Intruder prevention feature with ONE Touch. [Finger print] 100 fingerprints(max. ), Push to enter from Outside and Pull to enter from Inside. Say goodbye to password hassles. Now you can log on to your computer and your favorite Web sites with the touch of your finger, without having to remember all those passwords - simply place your finger on the receiver whenever a password or username is required. Works only with Windows 7, 8 and 10. Does not work with Windows XP and Windows Vista. NOTE: Please disable anti-virus during install. Keep Track of Visitor,See a detailed log of who has entered and exited your home, and exactly when they did, from your smartphone. AIGURD is one of most famous smart biometric security lock company in the world,which own 15 years experience on fingerprint recognition technology.we strives to provide our customers with the highest quality products and service through continuous research & development and dedicated technical support.we partners with original equipment manufacturers, independent software vendors, systems integrator and value added re-seller to develop and provide innovative fingerprint biometrics-enabled solutions to meet the various needs of their customers. we stand by our products, over 15 years smart security biometric lock experience.each of AIGURD lock come with high tech and excellent manufacturing process. no more wait,just try our lock as the start of smart home life. 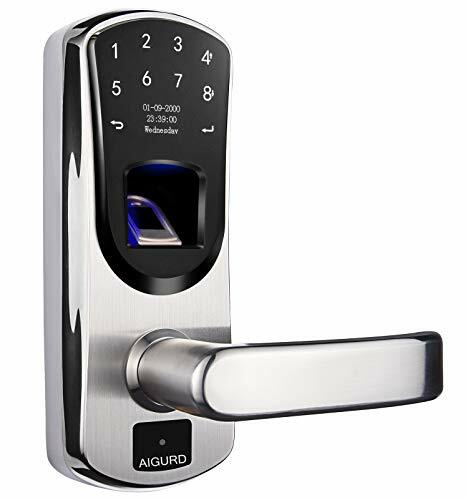 High Quality Guarantee - we stand by our products, over 15 years smart security biometric lock experience.each of AIGURD lock come with high tech and excellent manufacturing process. no more wait,just try our lock as the start of smart home life. 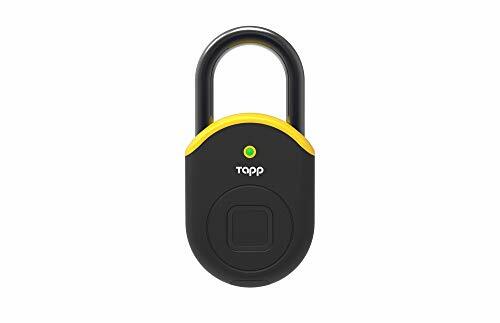 Tapplock one+ is a multi-functional utility lock. Tapplock's advanced fingerprint technology identifies the access user to 99.999% accuracy and grants access in under 0.8 seconds. Stores up to 500 fingerprints for multiple users per lock. 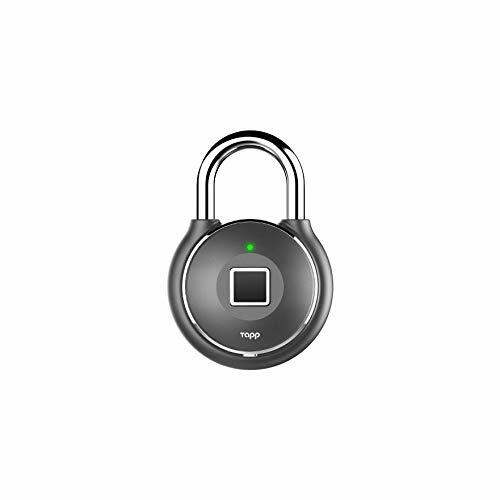 Tapplock one+ is equipped with reinforced stainless steel shackle and double layered housing body. It features our proprietary anti-shim technologies. The absence of a keyhole also eliminates risks of being picked. Tapplock one+ is rated IP67 waterproof and weather-proof. Fully functional between -20C and 65C (-4F and 149F). Three ways to unlock: Fingerprint, Bluetooth, and backup Morse Code unlocking by setting custom long / short combinations. 1-year use (or 3,500 unlocks) per 2-hour charge time. Check remaining power using the Tapplock app. More convenient: Directly implant software into the fingerprint time attendance with complex algorithm, eliminating the pain of using a complex attendance software. More simple: 5 minutes to learn operation, super easy operation process, three-step usage, you can export specific EXCEL format attendance report only with a U disk. Faster: High-standard fuzzy recognition algorithm, attendance speed is less than one second, employee attendance can be quickly accomplished. More precise: High-precision optical total reflection fingerprint entry device, strong resistance to scratch and wear, no biased recognition with automatically updated recognition algorithm. Wider application: Suitable for the entrances and exits of office, factory, hotel, school, etc. More Convenient&More Simple: Directly implant software into the fingerprint time attendance with complex algorithm, eliminating the pain of using a complex attendance software. 5 minutes to learn operation, super easy operation process, three-step usage, you can export specific EXCEL format attendance report only with a U disk. Faster: High-standard fuzzy recognition algorithm, attendance speed is less than one second, employee attendance can be quickly accomplished. Because of its sensitivity and efficiency, it will help you to eliminate the worry about handling with the attendance records for employees. More Precise: High-precision optical total reflection fingerprint entry device, strong resistance to scratch and wear, no biased recognition with automatically updated recognition algorithm. Wider Application: This attendance machine is used in a wide range of applications. In a modern society, you need to keep track of your employees' monthly attendance. With it, you can see the daily attendance records of your employees. Suitable for the entrances and exits of office, factory, hotel, school, etc. Quality Service: We promise you that if you encounter problems in the process of using, such as not storing fingerprints, there are unclear points in the operation, or problems with the product itself, please contact us in time and we will give you a satisfactory reply. The store is not easy to operate. Please also communicate with us before you leave a bad comment. Thank you.